Wheels, Slabrollers Extruders all that stuff. We have chosen to offer certain brands that we are confident of the value and quality. If there is a brand or model that you want, call us as we sell all major brands. Combining convenience with quality, power and capacity, the Artista™ Potter's Wheel has it all! Its lightweight and compact construction makes it portable and easily stored and its 25 lb. centering capacity makes this wheel a great fit for any studio or classroom. With an 11" wheel head, 1/3 HP motor that runs smoothly with very little noise, variable speed hand control (0-220 rpm) and a two-part splash pan (included), the Artista™ leaves little to desire in performance, quality and value. Available in standard and left-handed models, this potter's wheel also includes: (2) free Bats (B75, B12), (1) free instructional DVD and (1) free Speedball Glazes Sample Pack! 2 year warranty. A banding wheel is usually elevated so you can spin it with one hand while banding with the other. A turntable is usually lower, used to sculpt or decorate with. SHIMPO-Nidec’s banding wheels are used for decorating, sculpting, carving and hand building. Designed to provide reliably smooth and even rotation for the most delicate applications. 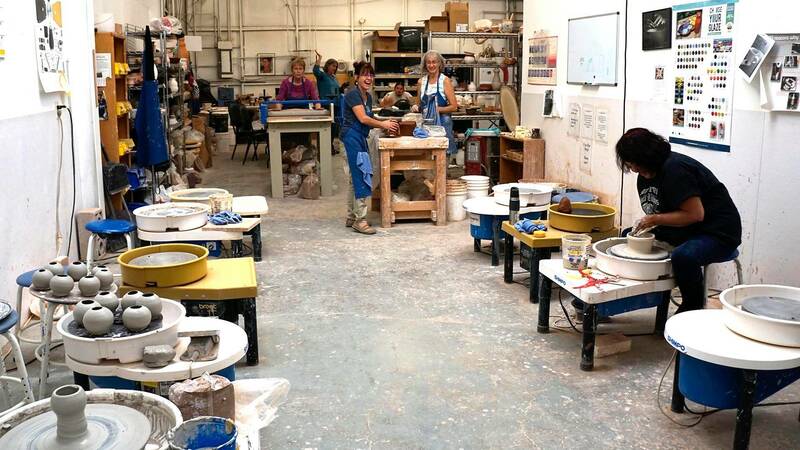 It's no wonder they are the banding wheel of choice for studio artists, production potters and classrooms alike. In four different models, we offer a selection of wheel-head diameters and heights. A Bat on the wheel head allows the potter to remove the pot from the wheel without distorting it. Or let it dry for a while then put it back on the wheel and keep working. Extruders take the clay and push it out of a tube, through a die to make a long coil or extrusion with a shape. Peter Pugger’s patented vacuum deairing technology is why other manufacturers are restricted to using vacuum screens in the design of their pugmills. There are inherent problems with vacuum screens such as: clogging/jamming due to obstructions, vacuum port blockage due to backpressure issues with extruding, maintenance and downtime, inability to mix and pug clay additives, i.e. grog, nylon fiber, exposure to air while in the “vacuum chamber”, and the list goes on. Peter Pugger has eliminated the cumbersome approach altogether. Peter Pugger evacuates the complete processing chamber during the mixing cycle. Once the vacuum gauge reaches the desired vacuum level, you are guaranteed deaired clay. Simple and maintenance free! In addition, Peter Pugger supplies the only 120V pugger-mixer on the market today. This is the result of efficient operation of the machine. If done right, a small vacuum pump is all that is required to effectively deair the clay. Peter Puggers are smooth, quiet and efficient. A division of NIDEC-SHIMPO AMERICA CORPORATION, manufactures and distributes ceramic equipment worldwide to the satisfaction of artists, teachers, students and businesses of all cultures. For nearly half a century we've been committed to continuing global traditions in making ceramic products for use in the home, in architecture and as art. SHIMPO's heavy-duty Slab Roller can produce up to a 3" thick slab. Two-roller system evenly distributes pressure on the slab to reduce warping. The dual-hand wheels and thickness indicator provide synchronized fine adjustment and allow for precise control of the slab thickness. SHIMPO's Slab Roller also includes a wagon wheel handle that provides effortless feeding of slab through rollers in either direction. It features a large 30" x 50" table for plenty of workspace and comes with one canvas set to complete the package. Much of this equipment is special order, call us. Bats and tools for making throwing on a potters wheel easier and more creative. Old school, built like a battleship! Brent wheels have set the standard for quality since 1969. During that time, they have earned a reputation for dependability that is unsurpassed by other brands. Each wheel is built with materials, components and workmanship designed to take the punishment of classroom and studio use over the long haul. Models range from the tabletop ie-t to the heavy-duty CXC with its 1 1/2 hp motor that can center over 100 lbs. of clay. Amaco® and Brent® potter's wheels accommodate the needs of the potter and small or large ceramic art departments. A wide range of quality accessories, including handextruders, bats, and bat mobile carts are also available.